Dinner parties offer excellent opportunities to socialize, pamper guests and express personal creativity. But the process can certainly be daunting. Guest lists, menu selection, food preparation, presentation, dietary needs, atmosphere and décor all deserve consideration. Clearly, you need a plan. 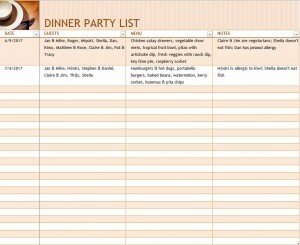 The Dinner Party Checklist provides the perfect tool for corralling ideas and clarifying the planning process. The Dinner Party Checklist is free, fully-customizable, and may be downloaded directly from this page. Simply click the download link, print your personal copy, and you’re on your way to a well-planned party. The spreadsheet format allows you to tailor the template to your specific needs. Add or delete columns and rows as desired to create space for tracking the information most important to you. Whether you use the template to list a few simple items like the date, guest list and menu or expand it to cover table settings, décor, seating arrangements, costs, RSVPs and the like, the Dinner Party Checklist gives you peace of mind that what is important to you is covered. Stress occurs when thoughts parade through the mind in repetitious disorder. Before tension builds, take a breather — capture your racing thoughts and record them on the Dinner Party Checklist. Soon your creativity will flow freely again. The Dinner Party Checklist is helpful at every stage of planning. Before your dinner, corral preliminary plans in one convenient place. During your dinner party, jog your memory to recall names that have slipped into oblivion. Double check to see if every dish you planned to serve has made it to the table. After your party, record your impressions of the event. What would you choose to do differently next time around? In what ways was your dinner a smashing success? Keep your dinner party checklist and refer to it when you plan your next event. Your detailed records will fuel your excitement as you begin again. Give the Dinner Party Checklist a try. Socialize, pamper your guests, and express your creativity with confidence. Your event is sure to impress.